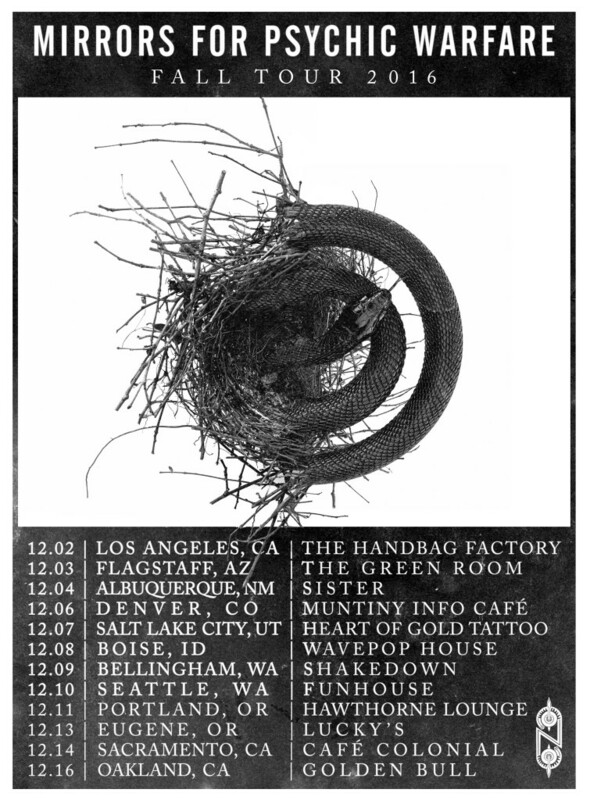 MIRRORS FOR PSYCHIC WARFARE will kick off a rare bout of US live dates this week. Slated to commence on December 2nd in Los Angeles, California and run through December 16th in Oakland, California, the journey will traverse twelve cities in eight states. MIRRORS FOR PSYCHIC WARFARE is the latest collaboration between Neurosis’ Scott Kelly and Buried At Sea’s Sanford Parker. The band released their self-titled debut – a sonic manifestation of insomnia, complete with the tossing, turning, and perennial dread that comes with facing another shabby daylight – earlier this year via Neurot Recordings. The five songs that comprise Mirrors For Psychic Warfare lurch and pulsate across a sullen, desolate landscape with an almost curious obsessiveness. And while Mirrors For Psychic Warfare may remind some of the best work on the classic Cold Meat Industry label, there is enough familiar Kelly/Parker-isms scattered throughout to keep the album stimulating. It is a work with more in common with a fever or a fitful wraith than a record. Check out the record, still streaming at Revolver Magazine at THIS LOCATION. Mirrors For Psychic Warfare was realized and recorded by both Kelly and Parker at Actual 13 Studio and Hypercube respectively over the course of 2015. The record was mixed and mastered by Parker and comes available in CD and vinyl form. This is not the first occasion where Kelly and Parker have joined forces. The two work together in Corrections House, a project that also features the talents of Mike IX Williams of Eyehategod, and Bruce Lamont of Yakuza, and where Corrections House seem hell-bent on impersonal bludgeon and unrestrained panic, the pair’s latest project — MIRRORS FOR PSYCHIC WARFARE — is far more restrained. For Mirrors For Psychic Warfare orders visit Neurot Recordings store.